Not to be confused with supermarket pot plants, whch do not last year to year outdoors. 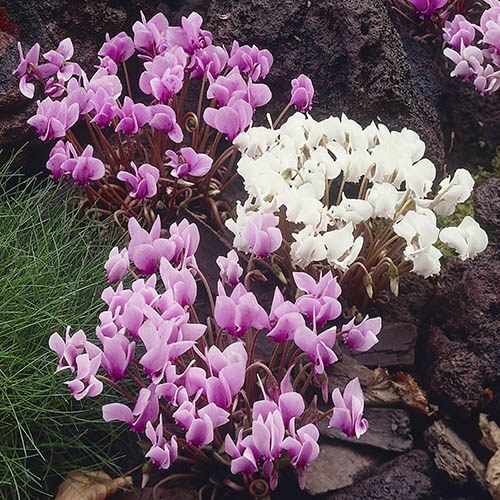 Supplied as a pack of 3 white and 3 pink established plants to plant out. You will get 3 pink flowered and 3 white flowered plants already one year old - not small bulbs that you need to wait years for flowers. Please note that plants are dormant when sent with little or no foliage present. Supplied as a pack of 6 x 9cm potted plants - 3 pink and 3 white, in flower and leaf in Autumn, already established and ready to plant straight out. Note that plants will be dormant with little or no foliage present.